1 Bdrm Grnd flr Flat. Hall. Lounge. Dining kitch. Bdrm. Bathrm (CT Band - B). 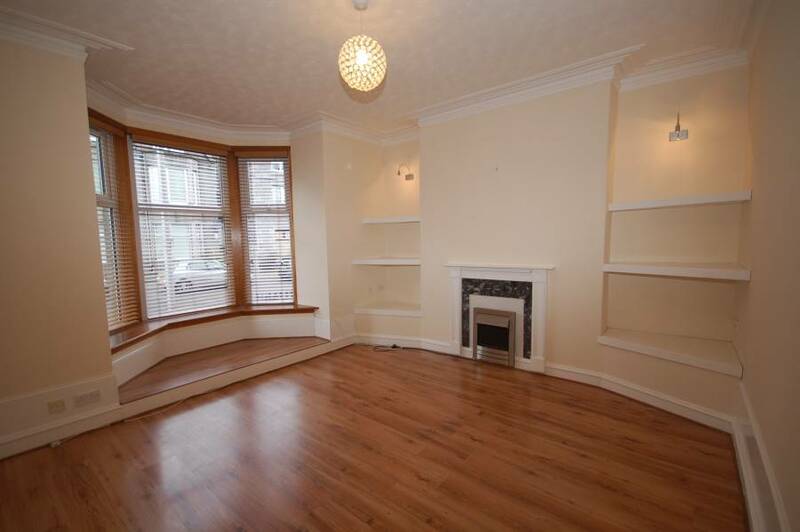 Price over £130,000 Entry by arr. Viewing Mrs Love 07434 813877 or 01224 722694. (EPC band - C). 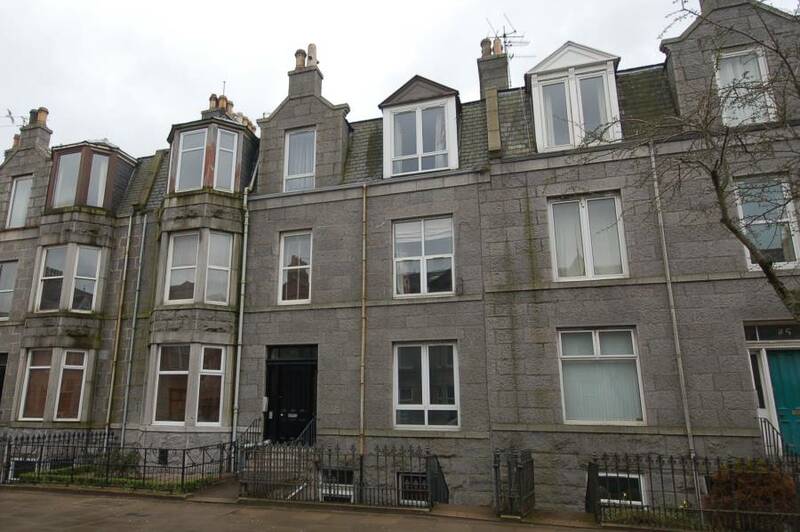 Enjoying an ideal central location and forming part of a well maintained granite building, this MOST ATTRACTIVE ONE BEDROOM GROUND FLOOR FLAT SIMPLY MUST BE VIEWED TO BE APPRECIATED. The property is in excellent order throughout and offers generously proportioned accommodation with a bright and airy atmosphere throughout. Over the recent years the property has had new UPVC double glazing installed along with a new bathroom and central heating boiler. Of particular appeal is the stunning lounge which boasts a large bay window with an elevated area suitable for a number of purposes. In addition there is a bright well equipped dining kitchen with all appliances included, a double bedroom with mirrored wardrobes and a well appointed modern bathroom with power shower. 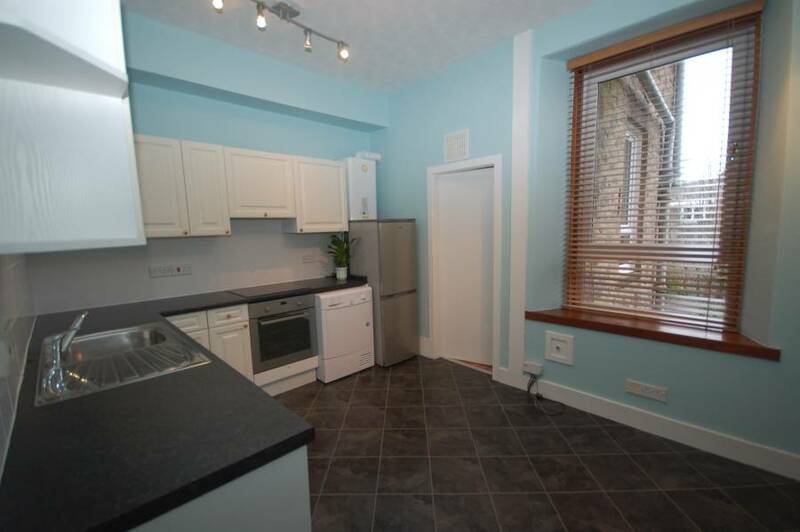 The property benefits from gas central heating and UPVC double glazing and Included in the sale price are all, blinds, light fittings and the white goods in the kitchen. A parking permit is available for on street car parking. Entrance Hallway: Entered via a hardwood entrance door; electric and gas meters at high level; laminate wooden flooring; security intercom handset. Lounge: (17’1 into bay window x 13’6 approx) Stunning room of generous proportions featuring a large bay window with elevated area to the front of the property; laminate wooden flooring; traditional ceiling cornicing and double skirting boards; fireplace housing an electric fire and deep shelving with wall lighting at either side; TV and telephone points; radiator. Dining Kitchen: (12’6 at longest x 11’8 approx) Superb well equipped dining kitchen with ample space for dining and enjoying an outlook to the rear; good supply of white wall and base units with co-ordinating worktop surfaces and tiled splashbacks; stainless steel sink unit with drainer and mixer tap; electric oven and ceramic hob; wall mounted central heating boiler; fridge freezer, washing machine and condenser dryer included; smoke alarm; tiled effect flooring. 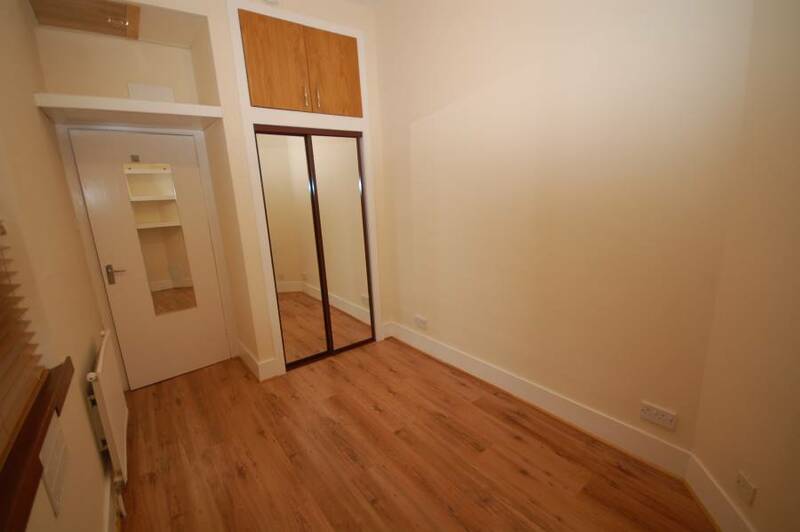 Double Bedroom: (13’2 x 7’6 approx) Double bedroom with window to side; double fitted mirror fronted wardrobe with additional overhead storage; laminate wooden flooring; wall shelving; telephone point; radiator. 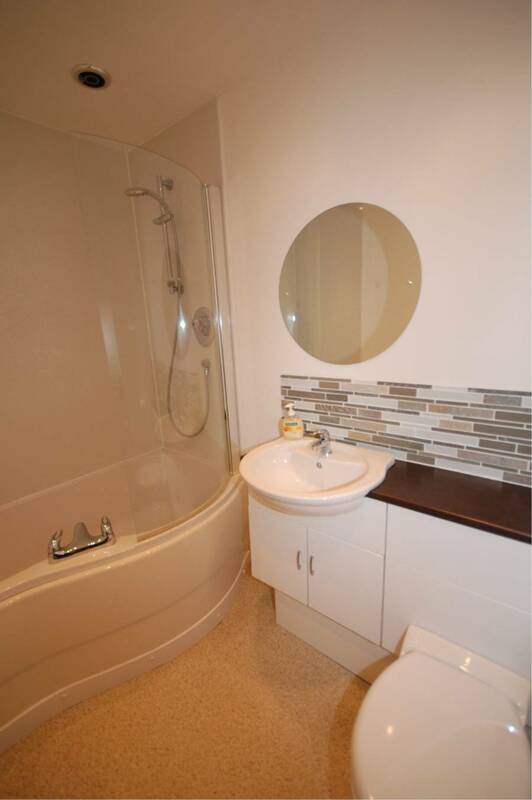 Bathroom: Well appointed bathroom fitted with a white suite comprising WC with concealed cistern, wash hand basin set in a vanity unit and bath with power shower fitting; shower screen; extractor fan; chrome ladder style radiator;. 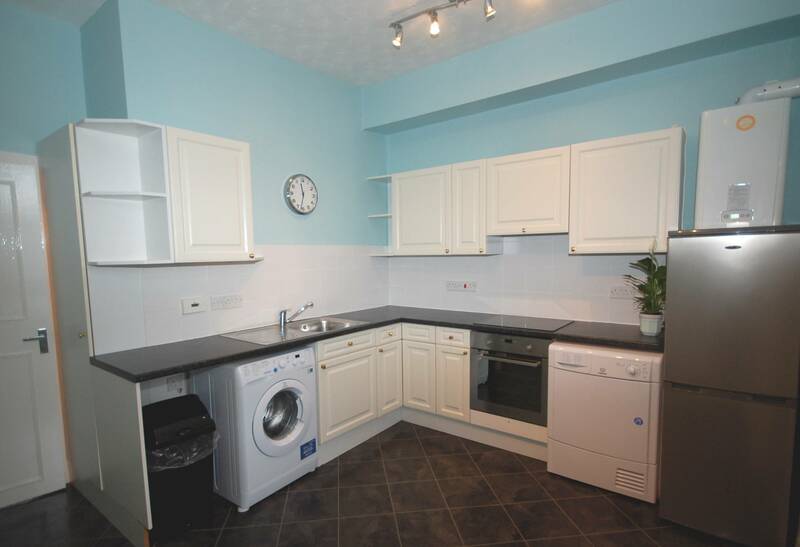 OUTSIDE Well Maintained Communal rear walled garden; Exclusive Cellar; Shared Store Cupboard. DIRECTIONS Travel west along Union Street turning left onto Holburn Street. Take the first right onto Union Grove and the property is located along on the left hand side. LOCATION Union Grove is a long tree-lined predominantly residential street is only minutes from Aberdeen's main thoroughfare, Union Street. There are local shops nearby for day to day needs and a regular bus service to the city centre and beyond. With its favoured west end location, easy access is afforded to the city's wealth of amenities, as well as the airport, the bus and railway stations and the business community on Albyn Place/Carden Place. The Foresterhill Hospital Campus and the Aberdeen universities are within easy reach. Regular public transport to many parts of the city is readily available.